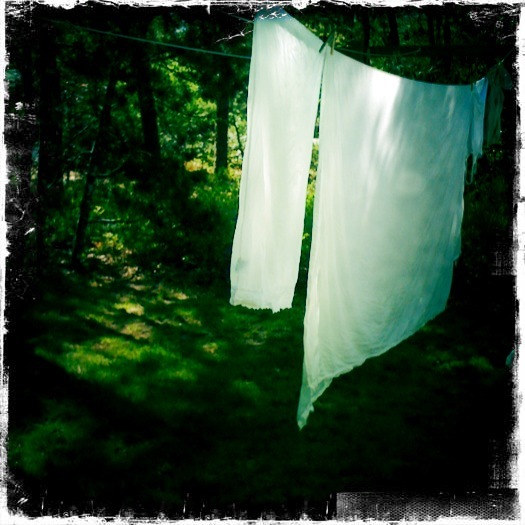 I love having a clothesline. My laundry area is in my basement, accessible only through a bulkhead. When I emerge from that dark space with a basket of just-bleached linens braced against one hip, the sun feels brighter and the air is suddenly more fragrant - sweet and spicy with lily of the valley, scrub pine, blueberry bushes and perhaps if the breeze is just right, a hint of saltiness from the ocean which is just down the road a bit as the crow flies. I hang each item, wooden clip to corner, in neat rows until all are in place, and I offer my efforts to the sun. Drying laundry in this way requires a certain degree of precision and attention that is not normally granted such a mundane task. Perhaps it is the ritual itself, which has otherwise been lost to the now mechanical process of laundering, that appeals to me as well. I can envision my counterpart 50 years ago, 80 years ago, 100 years ago - worlds apart culturally I suppose, but with this simple task in common. We each reach down to a basket, with back to the sky, then clip and stretch and clip. We work in silence, focused. My reward for the extra minutes spent on this task is a cotton shirt, a pillowcase, a sweater infused with the scent of lily, pine, sea and sun. There is no sensory experience that can compare. I will walk past my bed countless times today, sun-dried sheets tucked in, folded down and exhaling that remarkable scent. I will anticipate the end of the day when I can finally enfold myself in it, lay my face on the cool pillowcase and sleep surrounded by that simple sweetness.